Bluebonnets in the Texas Hill Country – We came across this lush field of bluebonnets in the Texas Hill Country outside of Llano on a back road in the hills. We had been traveling for over a month trying to find nice fields of bluebonnet wildflowers on these back roads. On this day the sun was starting to get lower in the sky and cast a golden glow over the trees as it was going down but with enough light left for the blueblonnets along this curved road. These are texas bluebonnets lupines that grow through out the state but the hill country has some of the best when its a good year. It looks like this might be an average good year for the wildflowers so we are happy to finally see more flowers this year. We have had either drought or flooding both of which are not alway good for the bluebonnets and other wildflowers, however they seem to be a little better so far this year. We love our bluebonnets in Texas we have festivals for them, we sell everything with bluebonnets on them including coffee cups, water bottles, T-shirt and pretty much anything you can think of! Bluebonnets start showing up around Texas in February down in the Big Bend area and around some coastal areas south of San Antonio. We were on my way down to beach for a friend birthday party in February and there were already blooming bluebonnets on IH35 going south from San Antonio even though that was more than a month early from when we see normally see them in the hill country. As a general rule the best time to see the Bluebonnets can be any time between the end of March and end of April. They might still be around but the grasses start to overtake the bluebonnet by the end of April, however all is not lost as other wildflowers will start showing up in May and June. Bluebonnets in the Texas Hil Country – We came across this lush field of bluebonnets in the Texas Hill Country outside of Llano on a back road in the hills. The sun was starting to get lower in the sky and cast a golden glow over the trees as it was going down but with enough light left for the blueblonnets. These are texas bluebonnets that grow through out the state but the hill country has some of the best when its a good year. It looks like this might be an average good year for the wildflowers so we are happy to finally see more flowers this year. We have had either drought or flooding both of which are not alway good for the bluebonnets and other wildflowers, however this years crop in the Texas hill country has been a pleasant surprise so far this year. You have appreciate how wonderful it is to take a drive in the hill country in springtime and see all these wonderful wildflowers just growing along the roads. The wildflowers can be seen along the main highways in the cities or on the back country road anywhere from February through April. We even have bluebonnet festivals just to show how much people in Texas love their wildflowers. Posted in Photo of the Day and tagged backroads, bluebonnet, bluebonnet landscape, bluebonnet season, bluebonnets, bluebonnets in the texas hill country, golden glow, hill country, images of bluebonnets, llano, pictures of bluebonnets, road, road side bluebonnets, road side wildflowers, rural, sun, texas, texas bluebonnets, Texas Hill Country, Texas wildflowers, wildflowers, wildflowers in the texas hill country, willow city loop on April 19, 2019 April 19, 2019 by Bee Creek Photo. 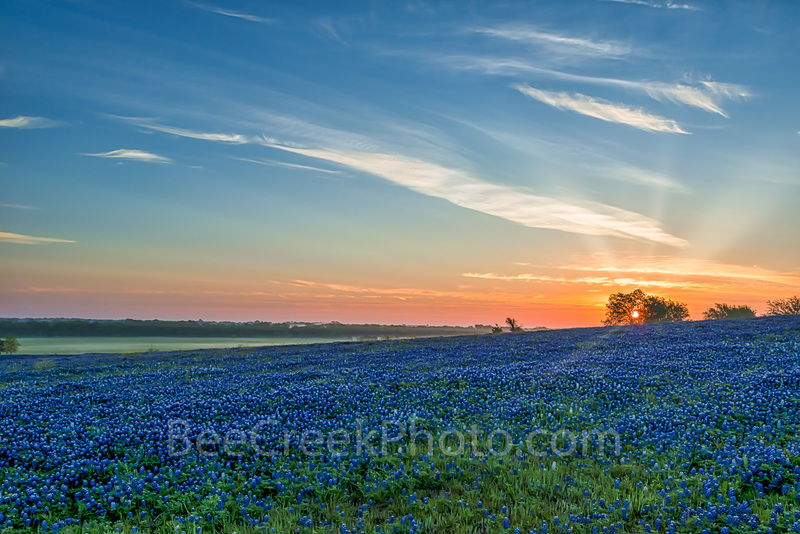 Bluebonnet Images – Bluebonnet Sunrise Morning – We capture this bluebonnet images at sunrise just as the sun rays were coming through the trees and rising over this ranch with a great field of bluebonnets along with the morning mist hovering over the field. Bluebonnet pictures are one of our favorite to capture and on a good year like they were this year it was easy landscape to capture. We capture this near Ennis Texas but they have never come back like they were since that time. We can only hope they will be as good as this in the next growing season somewhere. The Texas lupine is actually several different varieties of bluebonnets but all are beautiful to see along the roads, in fields and gardens in spring time. It is getting close to bluebonnet season again so we await the latest crop of flowers and hope for a good year! Bluebonnet Images – Bluebonnet Sunrise Mist – We capture this bluebonnet sunrise this as the sun rays were rising over this ranch with the bluebonnet and the morning mist hovering over the field. Bluebonnet pictures are one of our favorite to capture and on a good year like they were this year it was easy texas landscape to capture. Many years since the images of bluebonnets have been more elusive but we are persistant and continue to search out images of bluebonnets and other wildflowers every year. Posted in Photo of the Day and tagged Bluebonnet images, bluebonnet landscape, bluebonnets, bluebonnets in texas, bluebonnets over pasture, bluebonnets sunrise, fileld of bluebonnets, flora art, flora landscape, flowers, image of bluebonnets, landscape, mist, misty bluebonnets, morning, photos from texas, pictures of bluebonnets, ranch with bluebonnets, scenic landscape, spring flowers, spring landscape, spring wildflowers, sunrise, sunset, texas bluebonnet, texas bluebonnets, texas lupine, Texas wildflowers on January 15, 2019 February 8, 2019 by Bee Creek Photo. We were lucky to capture this wonderful field of a Texas bluebonnet sunset with a sprinkling of Indian paintbrush wildflowers with these hay bales with this great colorful sky with oranges, and pinks in this rural landscape. We came across them accidentally driving the back roads of Texas and we were allowed to come on to the farm property and photograph them for several days. These were the fullest field of bluebonnets we found this year. A great field of flower so of course we came back for a sunrise photo too. You don’t see bluebonnets fields with hay bales like this in our area so this was a unique find in our quest for all images of Texas wildflowers. When it comes to bluebonnets wildflowers Texans including myself go a little nuts over them, people come from all over to see them, take selfies in them, do family portraits, and for many other reason. In any case it is a very popular spring flower and there are people who follow the yearly wildflower reports like a bible just to find the best of the best every year. Now every years is not a bumper crop so it really depends on the weather, amount of rain we receive in the fall and again in the spring. The bluebonnets Lupines or Lupinus Texensis are the state flower of Texas. However, all lupines or considered the state flower in Texas. There are several other types in Texas such as the Lupinus Havardi or Big Bend Bluebonnet, the Lupinus Argenteus or silvery lupine, and several more but the most popular for most people is the ones in this field the Lupinus Texensis. As long as there are bluebonnets in Texas we will continue our quest to capture the best of the best every year. 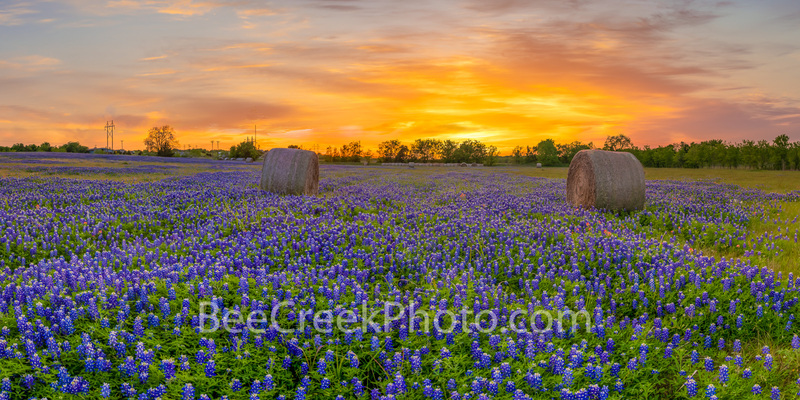 Sunset Over Texas blue bonnets Panorama – Texas Wildflower Landscape – This loved this capture of this field of Texas blue bonnets with hay bales in a panorama with this colorful sunset sky over this rural farm land. We like that we were able to capture this wonderful sunset just as the suns rays popped over the top of the hay bale as it got lower in the sky in this wonderful field of bluebonnets wildflowers in a rural Texas setting. You can see some indian paintbrush through out the incredible blue landscape at this Texas farm is overtaken in wildflower at sunset. Posted in Photo of the Day and tagged bluebonnet field, bluebonnet landscape, bluebonnets, colorful, field of wildflowers, flowers, hay bales, Haybales, indian paintbrush, landscape, panorama, popped, red, sun rays, sunset, Texas Bluebonnet Sunset, texas bluebonnets, wildflowers on May 4, 2018 January 14, 2019 by Bee Creek Photo. Bluebonnet Dirt Road – Captured these bluebonnets along this cedar fence and dirt road in the backroads of the Texas hill country. We had to go through two low water crossing with water up to the door to get here. 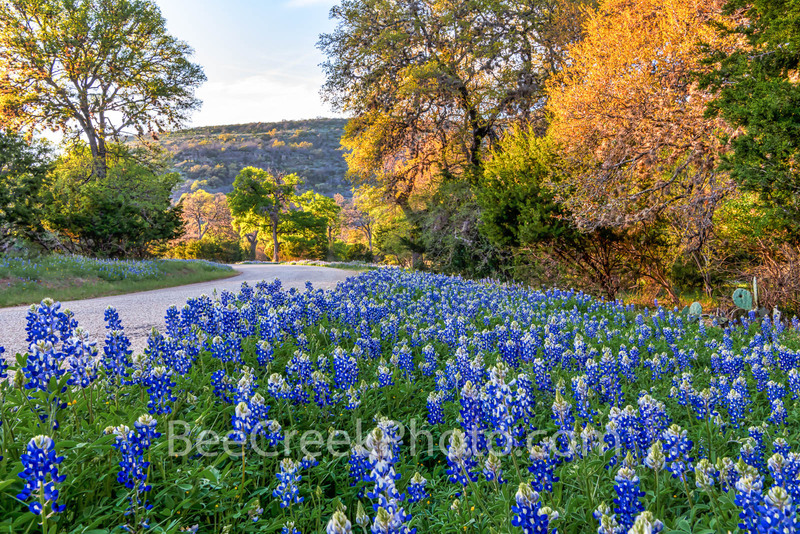 This is just an example of the rural landscape in the hill country and how lovely it looks especially around bluebonnet season. To catch that Texas landscapes you almost alway have to go down the back roads. Yucca Among the Bluebonnets – Captured this photo of a field of bluebonnets in front of a group of blomming yuccas in the Texas Hill Country on a nice afternoon with blue skys. It has been extremely overcast for ever it seems, so it nice to finally get out and get some photo and this one with the cactus and bluebonnets says Texas more than anything else. 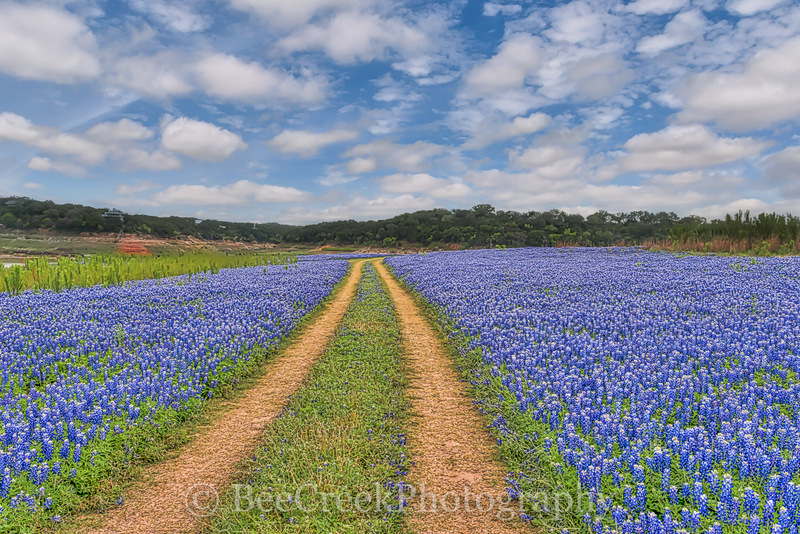 This bluebonnet landscape was a great find as this was a great year for wildflowers in central texas. 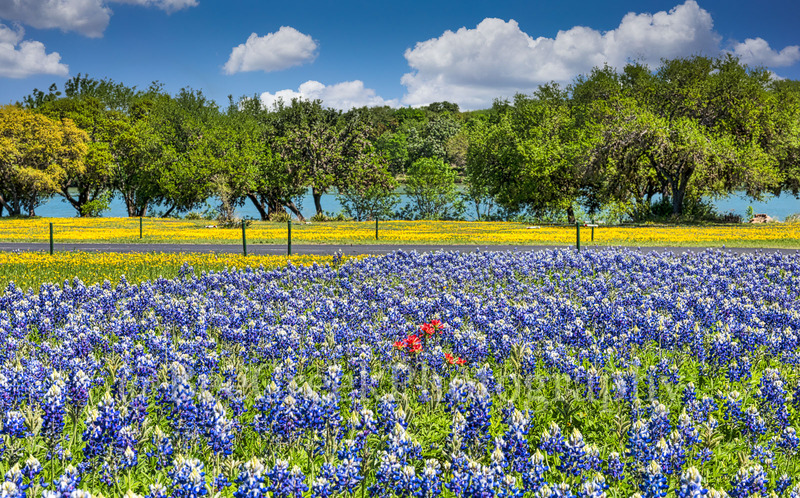 Colorful Wildflowers in Springtime – This great field of wildflowers with bluebonnets, and little yellow perky sue in this colorful field of flowers make for a nice contrast along the river in the Texas hill country. I like the little pop of red from the indian paintbrush in the middle of the bluebonnet field on this lovely day with blue sky and white puffy clouds along the tree line of the river. If you want to add a bit of spring this would make a nice wildflower landscape from the Texas Hill Country. 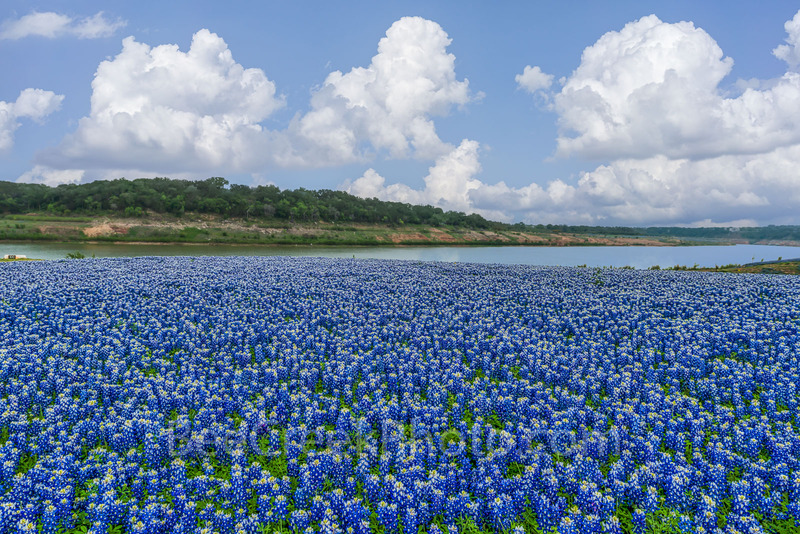 Incredible Bluebonnet Landscape – I pulled up this wonderful field of bluebonnets from my archives to share this great bluebonnet landscape along the Colorado river from spring a few years back. This is Muleshoe Bend park and this was the most incredible site of texas bluebonnets I think I had ever seen. As far as the eye could see it was acreas of bluebonnets along the river. This area is normally under water and for a few short years during the drought this is what came up where the water had once been. Well the water is back up and the bluebonnets are gone we just have a memories of these wonderful wildflower as they once were. Golden Blue Bonnet Sunrise – Captured this at sunrise as the sun came up it cast this golden glow over the clouds and river with just a hint of light on the bluebonnets. We thought it made a nice texas landscape image of this great field of blueblonnet at the lake in the texas hill country. Springtime in Texas is my favorite time because of the wildflowers we can all thank Lady Bird for help in making spring special every year. 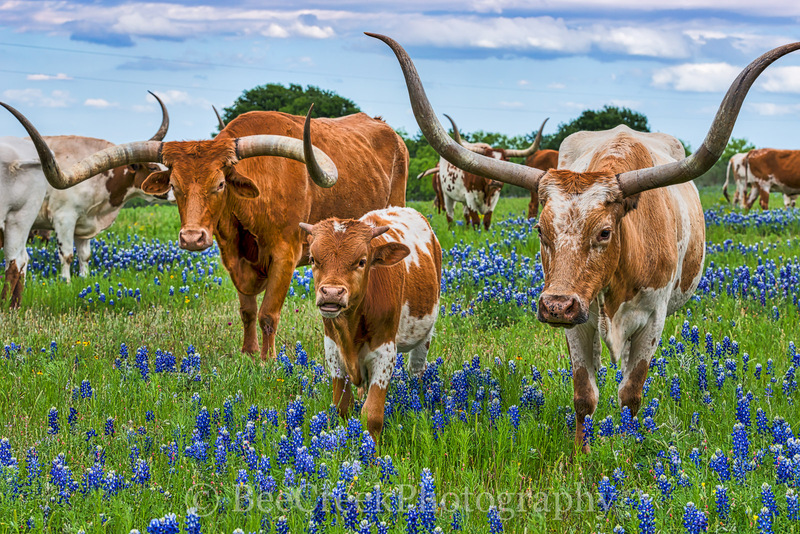 Texas Longhorns and Bluebonnets – We capture this image with this family of Texas Longhorn and her calf plus friend who stopped to pose for this picture in the bluebonnets. The mother is on the right and when we came the first time she took her calf as far away as possible from us. The second visit I guess did it. We loved all the different version of horns and this calf with his little horns were just too adorable in this field of bluebonnets. 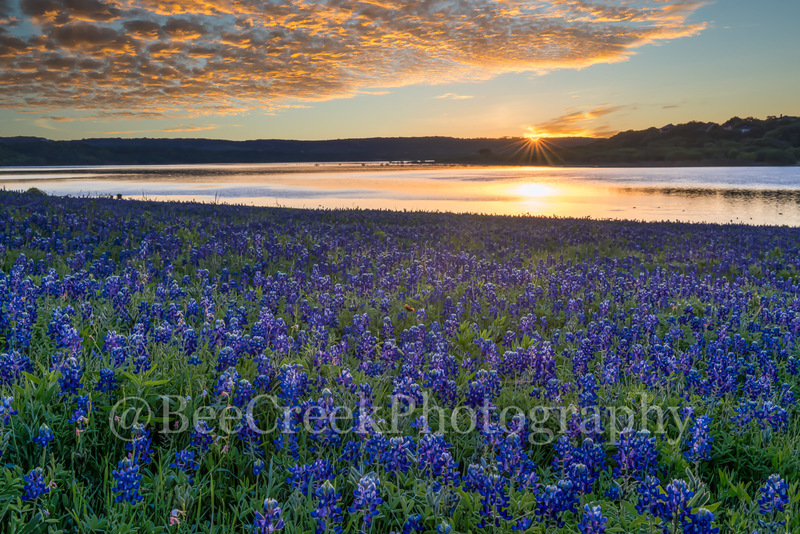 Bluebonnet Sunset – We captured this gorgeous sunset landscape with the bluebonnets one evening while at a county park along the Colorado river in Texas. The colors of the sky that came out with the sunset were beautiful with the oranges, pinks and reds. Couldn’t ask for a better sunset over the Texas wildflowers along the waters edge. 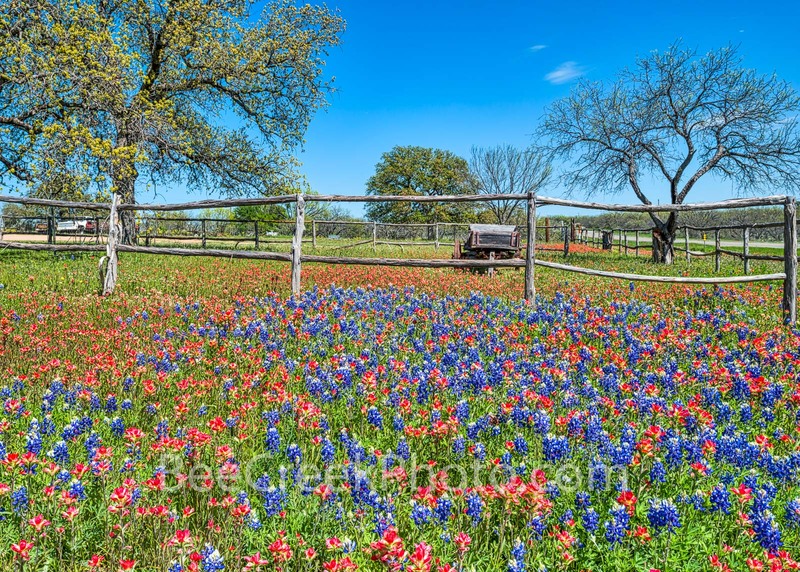 Old Wagon and Wildflowers – Bluebonnets, indian paintbrush wildflowers landscape long the road in the Texas Hill Country. We found this abundant field of flowers with this old wagon along the road in the hill country and stopped to capture it because we love the colorful mix of bluebonnets and indian paintbrushs. 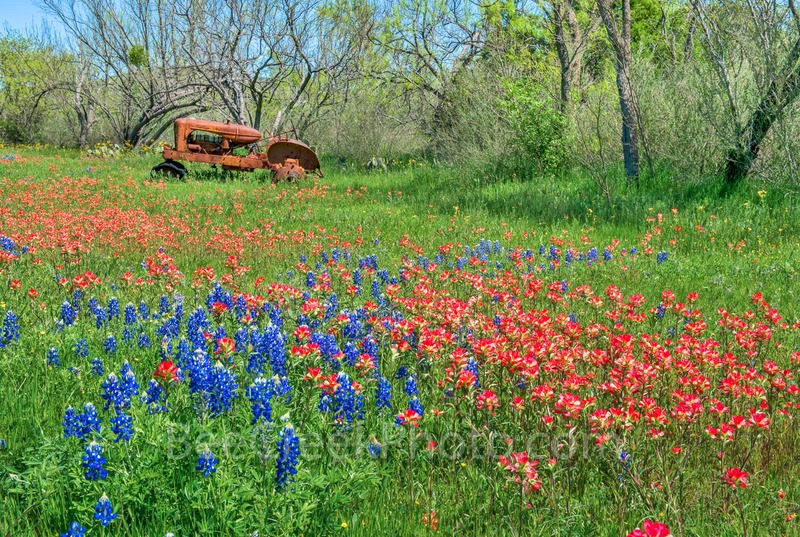 Wildflowers Landscape – We love these colorful wildflowers landscape of bluebonnets, and indian paintbrush in this field with an old rusty tractor in the Texas Hill Country. 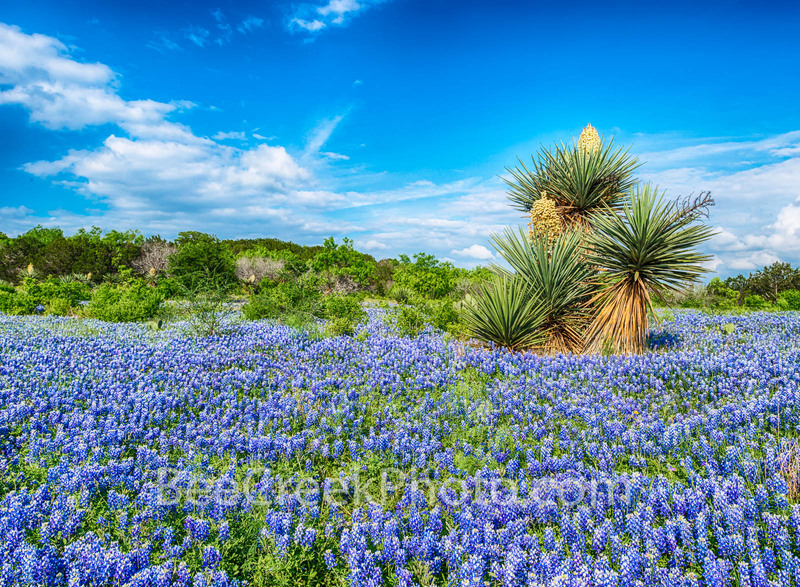 The Texas lupine or bluebonnet are probably the most photographed wildflower every spring. People travel from great distances to try and capture a unique image with bluebonnets so this is just that kind of photo with the old rusty tractor and wildflowers. Blue Bonnets Road – Bluebonnets beside the road in Muleshoe Park which were beautiful this year with some great clouds to make for a perfect image. This area is usually under water but for the last few years we have been in a drought so instead of water we see bluebonnets. This was one of the best areas in Texas for bluebonnet landscapes for a couple of year till the lakes in the Texas hill country filled back up. It was lovely till then to see so many texas wildflowers in this road of blue. Field of Texas Bluebonnets at Sunset Pano – This great field of Texas bluebonnets at sunset was probably the last we will see around the Texas Hill Country for this year. 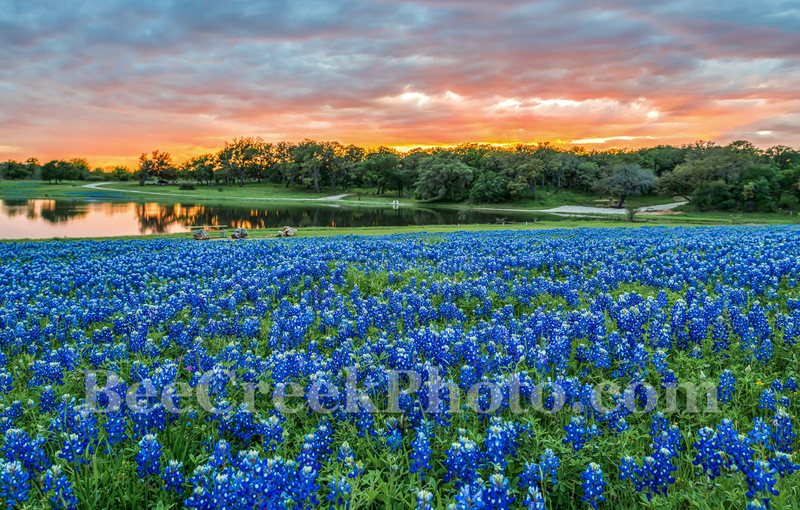 This panorama of bluebonnets landscape looked like waves of blue flowers in this field and the sunset cast this nice orange and red glow over the fiield of blue wildflowers. Another successful year of bluebonnets in the Texas Hill Country. Posted in Best Of and tagged Austin bluebonnets, blue, blue bonnets, bluebonnet, bluebonnet landscape, bluebonnets, Central Texas, clouds, colorful, field of bluebonnets, field of wildflowers, golden glow, hill country, images of texas, indian paintbrush, lake, landscape, Lupinus, muleshoe, old wagon, parks, perky sues, red, spring time, sunrise, sunsets, texas, texas bluebonnets, Texas Hill Country, texas landscape, tractor, wildflowers of texas, wildflowes, yellow on February 16, 2018 February 14, 2019 by Bee Creek Photo.